Home » Uncategorized » Bowhunting pheasant. 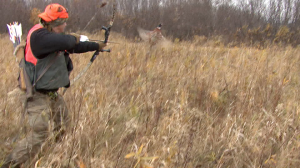 For less money than an out of state pheasant tag, you can be bowhunting pheasant at home. It’s not as hard as you might think, and with the right equipment, you don’t have to worry about loosing arrows either. An inexpensive recurve ($75 used) 3 flu flu’s and some Snaro’s or even just plain old field points are all a guy needs to be bowhunting pheasant. The field points will bring birds down, but you are going to lose a lot more arrows. It’s a great off season event as most states let you hunt the birds all the way through February or even March. Find a game farm and grab some friends and you have an afternoon of fun you will remember for a long time. You will up your odds a ton if you can scrounge up a pointing dog for the day. Having a pointer makes it easy to find the birds, but more importantly has you ready for the flush. Success bowhunting pheasant comes easier when your feet are planted and you are ready to draw, than when the birds catch you off guard. I have killed them with out a dog, but it really is 5 times easier with a pointer who gives you time to get close and positioned for the flush. Your Snaro heads can break a wing and that dog may be the only way you recover that bird. Check our poundage chart for which head will work best with your rig for best results. If you’re not sure bowhunting pheasant is for you, get a recurve and a few flu flu’s and try some hand thrown aerial archery. I tell everyone shooting aerial targets is like throwing rocks. If you like it you keep throwing rocks until you start hitting things. It’s not quite that simple, but it is not complicated or magic either. 5 or 6 trys will let you know if it’s a game you want to try, and I have met very few archers who don’t think it’s a kick, and if you don’t like it you will still have the gear to bowhunt small game like rabbits and ground squirrel. Hit a couple 2 liter bottles thrown in the air, and I bet you become another person who wants to try bowhunting pheasant this year. I remember my first trip to South Dakota to chase wild pheasants. I walked with the gun hunters and some were kind enough to let me fling before they unloaded. I did manage to hit 3 birds that trip and stoned one before a gun fired. 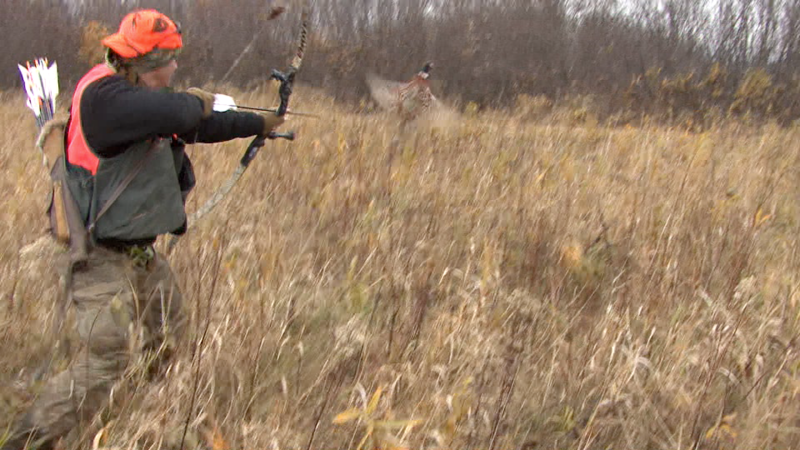 Bowhunting pheasant is hands down one of my favorite archery activities. In fact, Doc Schwartz designed the Snaro bird points specifically for bowhunting pheasant. Give it a shot, and most either get hooked on, or at least have some great stories and memories of bowhunting pheasant.